Most people don't look forward to packing their vehicles. If you have a lot of things to fit, it's a tough job of juggling objects as you try to get the hatch open and treating the storage space like a jigsaw puzzle as you try to make the best use of the space that you have. 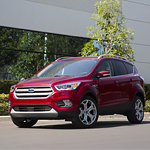 But if you're looking for a popular compact SUV, check out the Ford Escape and its convenience features. The hands-free, foot-activated liftgate solves your problems if you hate putting your cargo on the ground when you need to open the back of the vehicle. When you have the Intelligent Access key on you, just kick your foot out, then the liftgate swings open. If you feel frustrated packing the back compartment, you'll appreciate how the back-seat folds down to offer you more room. Otherwise, you can fold down one seat to leave room for another passenger.